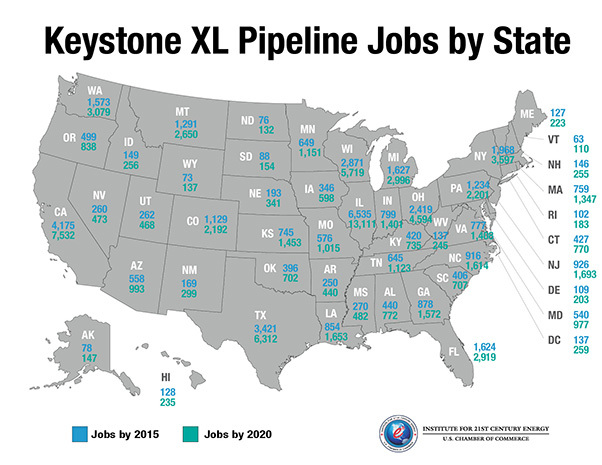 The numbers speak for themselves (for more info: http://www.energyxxi.org/keystone-xl-benefits). With the recent news that the House once again passed the Keystone Pipeline with the votes of 31 Democrats, the pipeline is back in the news once again. In fact, the Senate is finally going to vote on it in a last-ditch attempt to rescue Democrat Mary Landrieu from a runoff that she is guaranteed to lose. The House version was sponsored by her opponent, soon-to-be Senator Bill Cassidy. When Obama can’t even keep Chris Matthews on his side on this issue, you know it’s time for him to give up and move on. The only question is: will he? I last wrote about Keystone when the last government report was issued that (once again) confirmed there is no reason not to build it. Sadly, after more stalling, most of it remains as relevant as when it was first published. Thud. Thud. Thud. In case no one else heard, those were the final nails in the coffin of anti-Keystone argument. Only in Washington, does it take 5 years to confirm what the American people knew all along: that Keystone is a job creator and that it won’t harm the environment. If this sounds familiar, it’s because it should. In 2013, a similar report was released, with virtually the same exact conclusion. Prior to this latest report’s release, it was often described as the final stand for foes of the pipeline. Now that the State Department has said that Keystone will have a negligible environmental impact, it’s time to finally build it. Needless to say, this report puts Obama between a pipeline and a hard place, and his dithering has appeased neither side. Although this pipeline is a win-win for the American people, it is interesting that Obama’s decision will, in essence, show which Democratic constituency is more important to him. Green groups obviously continue to oppose the pipeline (at this point, I’m not sure why), but many unions actually support the pipeline’s construction. If Obama chooses to side with the Green groups over the majority of the American people, we all will lose. In fact, Keystone is one of the few areas where bipartisan consensus is still possible in DC. Almost a third of senate Democrats voted for an amendment that urged its construction. This vote had the support of freshman Democrats such as North Dakota’s Heidi Heitkamp and also one of the most senior members, Montana’s Max Baucus. Another interesting aspect of the report is that building the pipeline, as opposed to a railroad, will actually prevent 6 deaths per year caused by rail transportation. That is something I had never even considered, but it goes back to this being the safest pipeline currently envisioned, despite almost 2,000 days of senseless delay. So, President Obama, with $7 billion in investment, 20,000 jobs, and the future of American energy independence, I ask you to pick up your pen. The time to act has long since passed. As a reminder of just how long it’s been, look no further than right here to get the exact time.